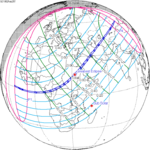 A total solar eclipse occurred on September 12, 1950. A solar eclipse occurs when the Moon passes between Earth and the Sun, thereby totally or partly obscuring the image of the Sun for a viewer on Earth. 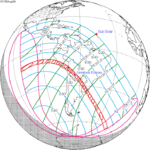 A total solar eclipse occurs when the Moon's apparent diameter is larger than the Sun's, blocking all direct sunlight, turning day into darkness. Totality occurs in a narrow path across Earth's surface, with the partial solar eclipse visible over a surrounding region thousands of kilometres wide. Totality was visible from eastern Soviet Union (today's Russia) and the whole Semichi Islands in Alaska. This eclipse is a member of a semester series. 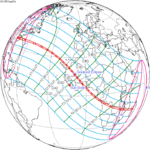 An eclipse in a semester series of solar eclipses repeats approximately every 177 days and 4 hours (a semester) at alternating nodes of the Moon's orbit. ^ van Gent, R.H. "Solar- and Lunar-Eclipse Predictions from Antiquity to the Present". A Catalogue of Eclipse Cycles. Utrecht University. Retrieved 6 October 2018. This Solar eclipse-related article is a stub. You can help Wikipedia by expanding it. This page was last edited on 31 January 2019, at 23:07 (UTC).